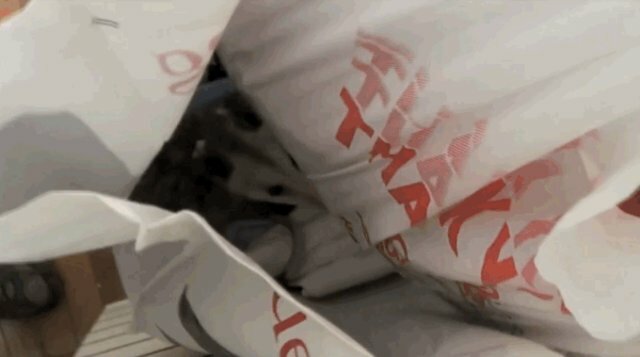 One little possum was recently freed after being trapped for a week in rather unusual prison: a retail store. The Humane Society of the United States (HSUS) received a call from a Washington D.C. store owner saying that a possum had fallen through one of the store's ceiling access panels. Apparently the little creature had been living in the store for about a week - staying out of sight during the day, but leaving merchandise strewn about the floor overnight. 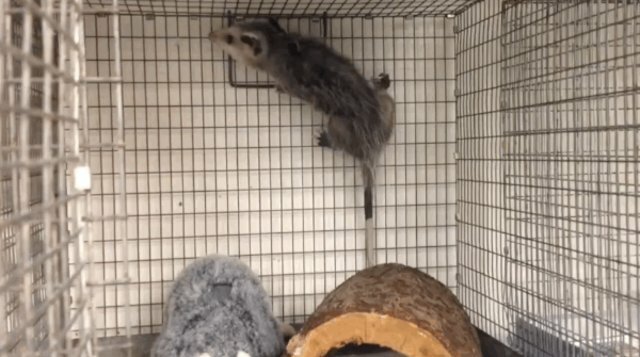 The possum had essentially been stuck inside the store for a week, with little access to food or water, so the HSUS knew that the rescue was urgent. After searching the premises high and low, the little stowaway was discovered hiding in a plastic bag in the back office. Rescue workers could see that the little possum was very malnourished. 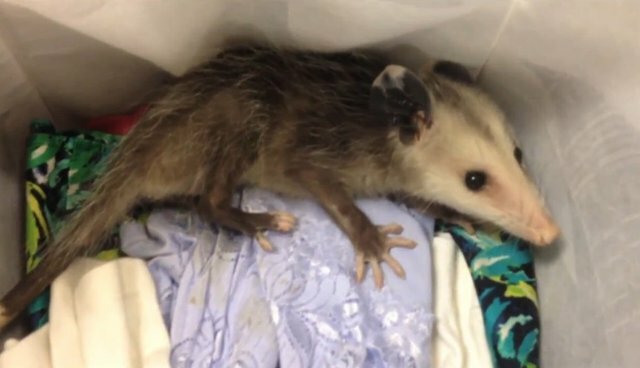 The possum was taken to City Wildlife, the only wildlife rehabilitation center in the D.C. area. 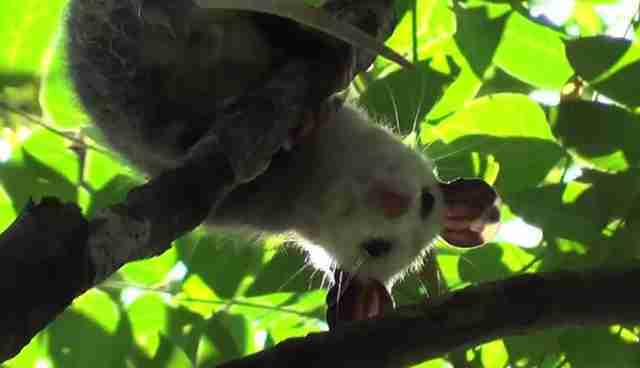 Workers at the wildlife center noted that, although the little possum was young, he had already separated from his mother. The main goal was helping the little guy get some meat on his bones and stay hydrated before his rerelease. After six days of nourishment and care, the little possum was rereleased into the wild, where he happily scampered away to climb a tree. The full video account of the rescue mission can be watched here on the HSUS website. 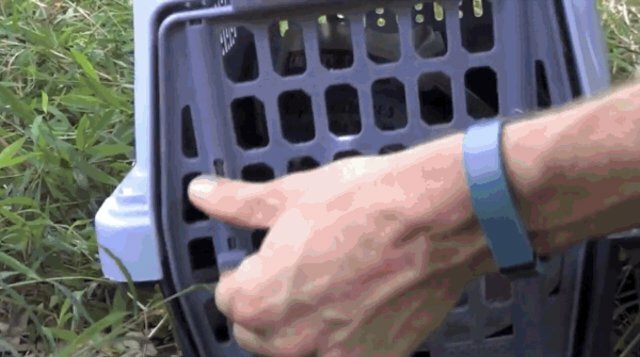 Rescue worker Abby Hehmeyer remarked that possums are "really transient, so they can kind of be released wherever ... they're really good at adapting to these kind of environments, and actually really good to have around in the city." According to the Humane Society, possums are often blamed for other animals' transgressions. Raccoons or stray dogs will tip over trash cans, but the slower-moving possums are the ones who get caught "red-handed" eating the scattered debris. People also mistakenly misinterpret possum defense mechanisms, such as baring teeth and hissing, as signs of rabies. In actuality, possums are less likely to contract rabies than other mammals, as they have a lower body temperature than most warm-blooded creatures. Says John Griffin, director of HSUS's Humane Wildlife Services Department, "[Possums] are one of our more beneficial, yet misunderstood, wild neighbors." If you are looking for ways to pass the olive branch and peacefully coexist with any possums in your area, the Wildlife Center of Silicon Valley has some helpful tips. And always remember to call wildlife rescue if you notice a possum or other wild animal in distress, as opposed to handling the creature yourself!